Deliciously Spring is a 300 piece jigsaw puzzle designed by artist Mary Ann Vessey. A girl pulls her sister in a wagon through town to enjoy the beautiful weather and colours of spring. Horses graze in the grass by the side of the road and cows rest on a hill above the newly planted fields. Available in two piece counts. 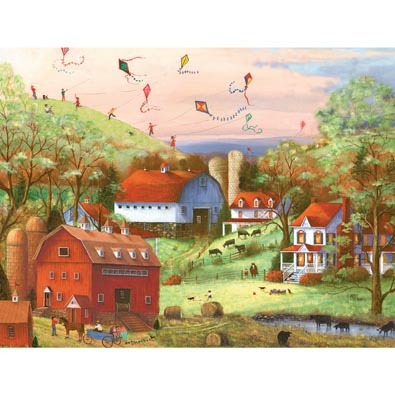 Sunflower Farm is a 300 piece jigsaw puzzle designed by artist Mary Ann Vessey. A country farm house is decorated with blooming sunflowers and bright fall flowers. Around the house colourful fall leaves cover the trees and pumpkins grow in a patch with hay stacks across the street. Available in two piece counts.